It is one of the hill foot villages situated between the Ochil hills range to the north and the Devon River to the south. Dollar in Scotland is a small town located in the County of Clakmannanshire. The word Dollar in Scottish Gaelic means Dolar.The name of the town is traditionally related to the story of a lovelorn princess, who died in the castle of her broken heart, hence Dollar, a derivation of the word Dolor, meaning grief, common in many European languages.The place is best known for its Academy which was founded way back in 1820 and is one of Scotland's most respected private schools. In the yesteryears Dollar was renowned as an industrial area and attempts were made in the 18th century to exploit the mineral resources deposited in the area, but the attempts were foiled owing to the lack of economic significance. The textile industry played a vital role in the townÃ¢Â€Â™s economy. Now Dollar has converted itself into a residential area. The town is now largely a dormitory community for people who work in Stirling and the surrounding areas including Glasgow and Edinburgh. Because of the relative success of its fee-paying school Dollar Academy and its tranquil environment, the town draws young and reasonably well-off families, giving it a slightly different character from the other Hillfoots Villages. Many prominent personalities were brought up and they drew their inspiration from the Dollar town. It was the home town of Scottish sinologist James Legge, the translator of The Chinese Classics. The Chinese scholar Wang Tao lived in Dollar from 1870-1872 and he wrote two travel notes: "Wondering in the Rambling Park" and "Touring the Mountain in Dollar" in his book "Jottings from Carefree Travel". In the late 1990's, Michael Kulas and Saul Davies, musicians in the English rock group James also resided and worked out of the old Tea House Cottage, now known as Brewlands, next to Castle Campbell. The well renowned Dollar Academy was founded in 1818 with the contribution from Captain John McNabb, a Dollar native who had allegedly made his fortune in the slave trade. The inventor of the vacuum flask, James Dewar, was a pupil of this academy. The noted Esperantist William Auld, nominated three times for the Nobel Prize in Literature, lived in Dollar until his death in 2006. The painter J. M. W. Turner visited Dollar and made sketches in the glen. BBC Gaza correspondent Alan Johnston was educated at Dollar Academy. The Scottish author Iain Banks studied at the nearby University of Stirling and, in an interview for the South Bank Show in 1997 spoke about using the landscape above Dollar as inspiration for his novels. If you're after a sandwich or something for a picnic, then look no further than Nesbits, a popular local deli on the main street. There are regular buses to Dollar from Stirling. There are also buses to and fromAlloa. The A91 passes through the gloriously named hamlet of Yetts o' Muckhart, at the junction with the scenic A823 which runs north through Glen Devon to meet the A9 Stirling-Perth road, near the famousGleneagles Hotel. A few miles north of Yetts o' Muckhart, at the village of Glendevon is a basic F SYHA Youth Hostel, Tel. 781206, open mid-March to early October, which provides information on walks in the Ochil Hills. South of Yetts o' Muckhart is Rumbling Bridge, at the junction of the A823 and A977, from where there are breathtaking views down into a deep gorge. There are many tourist attractions available in Dollar, Clakmannanshire, the major attraction among them being the five hundred year-old Castle Campbell, lowland seat of the Duke of Argyll, where Queen Mary of Scotland once lived in the 16th century. The path to the castle has a steep slope, bridges over the glen and its tributaries. There is also an alternative route to the top for those people who are less energetic. A rumbling park named the Mill Green Park is located at the foot of Dollar Glen. There is a small museum which displays curious collection of local items and much information about the Devon Valley Railways, which was closed in the 1960s, is also made available here. Dollar offer lot of scope for sports lovers, there is an 18-hole golf course, which is notable for its steep inclines, which therefore provide you a wonderful golfing experience. There are several specialised clubs for tennis, squash and cricket. The Ochil Hills that overlook Dollar provides a perfect base for mountain biking and other adventurous sports. The Devon River situated nearby is occasionally used for fishing. There are two churches in the area, one Church of Scotland and one Scottish Episcopalian. Top of the bill in these parts is the well-heeled little town of Dollar, 11 miles east of Stirling and well worthy of a day trip. Looming above the town at the head of magical Dollar Glen, is the spectacularly sited Castle Campbell, standing between two deep ravines and formerly known as Castle Gloom, until it passed into the hands of the Campbells in the 15th century. The castle was sacked by Cromwell's troops in 1654, but the tower is well preserved and there are fantastic views down Dollar Glen from the parapet. Dollar in Clakmannanshire, with all these prominent places and its natural beauty will attract the tourist with varied taste. 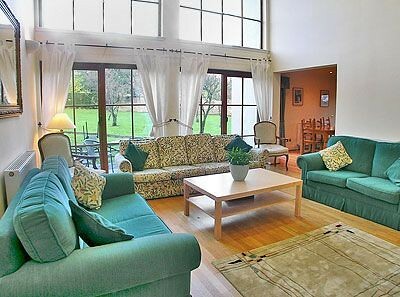 Accommodation in Dollar, Scotland, offers a comfortable stay with all the comfortable facilities included in it. There are many Self catering cottages in Dollar available for the convenience of the visitors. If you are looking for self catering accommodation, or serviced apartments in Aberdeenshire, visit this page instead (Cottages and apartments around Scotland ) . If you are looking for real cheap accommodation in Scotland, have a look at our hostels around Scotland instead. For something a little better, go for the hotels in Scotland which is here. Many people wonder what the difference between a guesthouse and a bed & breakfast really is. This is our definition for a bed and breakfast: a private home that offers a bed for the night and breakfast in the morning at one cost. This is offered to "transient" visitors and has less than 10 bedrooms. Bed & breakfast accommodation can vary between the absolutely excellent to the mediocre and pretty dire. Many people swear by B&Bs as it offers the opportunity to meet local people, get local advice and other informations on the breakfast table and a price which is usually lower than hotels or guesthouse accommodation. Drawbacks: less flexible than larger properties (they have a life as well). Quality can vary. We also have a range of guesthouses and hotels available across Scotland as well as our Visitor Guide to Scotland. If you are looking for things to do, you might to visit the Calendar of things to do in Scotland or our Ideas and Inspirations section. We can also help with car hire and trains and ferries. Wooden lodge, in private park between Dollar & Gleneagles. Sleeps six people in three bedrooms.